What a beautiful name for a beautiful vessel. Each area of the British coastline evolved particular types of traditional boats developed to suit the shoreline and the local fishing methods. The Lerret was the boat of the Dorset coast read more about them and how they were used here and here. By this time last year there was only one Lerret left in seaworthy condition and that was built in 1923 but now there are two. 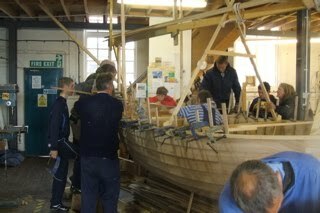 This is a wonderful story, Gail McGarva was grant aided by the Queen Elizabeth Scholarship Trust to build a new Lerret at the boat building academy in Lyme using the old techniques and it is now just about finished. The launch will be a public event and I would be going if it was not so far away. Gail will launch the new Lerret from the slipway in Lyme Regis at 1130 on Saturday 31st July. "We took the lines from the last seaworthy Lerret -'Vera' of 1923 to create the 'daughtership'. The shape of the boat is wonderful- a true reflection of the evolution of form and function.The boat was designed to be launched from the steep stony shelved beaches of Lyme Bay and her shape wholly reflects this. Flat-floored in the midships with the most swooping curves to the double ended stems. I am persuading the elm into shape with the help of steam and patience. The build of the Lerret has ignited a whole oral history project.People have been coming forward with their photographs,drawings and stories.In conjunction with the Lyme Regis museum I am applying for some funds to create an oral history book and exhibition speaking out the stories of the Lerret." As a traditional woodworker myself I have the utmost respect for wooden boatbuilding and for me this style of small clinker built vessel is just about a beautiful as they come. 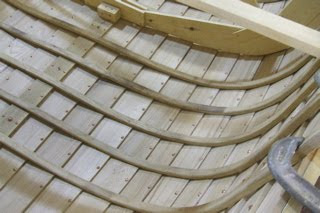 Directly descended from Viking and Saxon boats the construction techniques have changed little. Steam bent planks are overlapped and joined by copper boat nails. I use the same nails in my oak bridges, they grip really well and don't react with the tanin in the oak. I think there is only one place left making them John Reynolds in Birmingham and when you phone up they put a batch through for you the size you want. Here are a few more pics of the build in progress. I heard several years ago about a remarkable scheme in France, when they realised they were on the brink of loosing the skills to build their regional boats the French decided to build a new on of each of their regional boats. The boats were I believe sponsored by local businesses and afterwards used to take tourist on trips. Each town then had a new local boat but more important the skills were passed down. 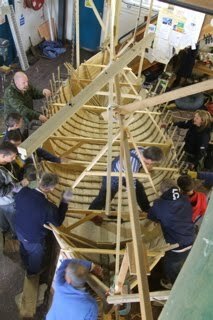 It was felt important that rather than just preserving and fixing up old boats they should build a complete new one and that each generation say every 25 years or so they should build another so that the skills could be handed down again. 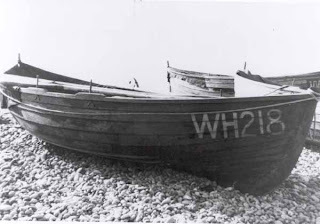 We have so many regional boats from Whitby Cobles to Flatners, Norfolk Wherries to Thames sailing barges. How wonderful it would be to see a new one of each built every 25 years, how inspirational it could be for the local community and what a wonderful hands on way to learn about local culture and heritage. I imagine the children who helped Gail McGarva steam bending the timbers for this boat will remember it for many years to come. 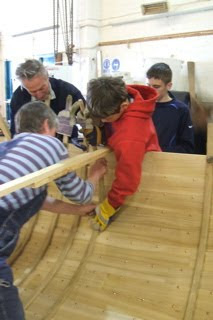 Great story and a great idea, building a new traditional boat every generation.